Nothing like a good drama on a Sunday afternoon. After holding off San Diego's late charge (pun very much intended), the Redskins scored on the opening possession of overtime on Darrel Young's third touchdown rush of the game and improved to 3-5 in a 30-24 victory. The afternoon started out promising enough. The Redskins forced the Chargers to punt on their opening drive, then drove the ball down the field as Robert Griffin III spread the ball around on a nine-minute, 16-play, 92-yard drive. It just so happened that the final play of the drive ended up being a blocked field goal, keeping the game scoreless. San Diego's block was its first in exactly 11 years. Washington's next drive was significantly shorter. On the first play from just outside of the end zone, Griffin's pass was deflected by Lawrence Guy -- who also blocked Kai Forbath's first field goal attempt -- and landed in the arms of Sean Lissemore for the interception and touchdown, giving the Chargers a 7-0 lead. Alfred Morris responded with a five-yard touchdown run, but Eddie Royal's 15-yard touchdown catch restored the Chargers' seven-point lead. With time expiring in the first half, Forbath's field goal try -- this time from 59 yards -- was blocked once again. Let's fast forward to the waning moments of regulation. 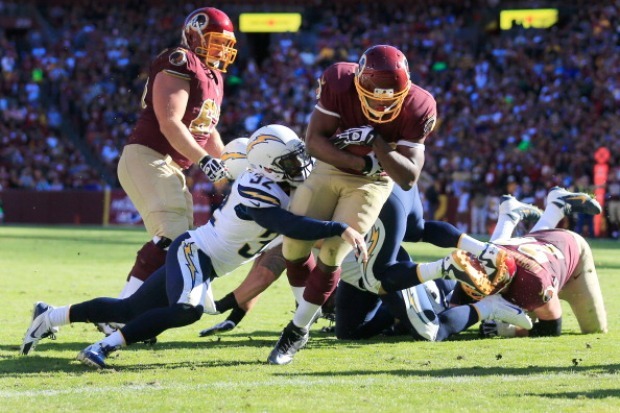 The Redskins held a 24-21 lead with just over two minutes remaining, but the Chargers, starting at their 8-yard line, quickly drove down the field, originally capping off the drive with a Danny Woodhead touchdown to take a late lead of their own. The call on the field was reversed upon further review, but San Diego still had a first down at the 1-yard line and two timeouts. On first down, Woodhead failed to punch the ball into the end zone, which was followed by two incomplete passes as the Redskins' defense stood tall. The Chargers settled for a field goal to send the game into overtime tied at 24. Washington won the overtime coin toss and chose to receive, and on the 10th play of the drive, Young ran in from four yards out to clinch the victory.